Medicare Offers Expanded Coverage To Battle Expanding Waistlines : Shots - Health News Medicare will now cover screening and counseling for obesity as a free preventive service. Advocates hope the decision will encourage private insurers and Medicaid to do the same. The Centers for Medicare and Medicaid Services says it will cover screening and counseling for obesity as a free preventive service for Medicare beneficiaries. Keeping off the pounds is tough at any age. Now seniors are getting a helping hand from the Centers for Medicare and Medicaid Services, which has announced that it will cover screening and counseling for obesity as a free preventive service for Medicare beneficiaries. Advocates hope that CMS's decision may encourage private insurers and Medicaid to begin covering obesity screening and counseling as well. 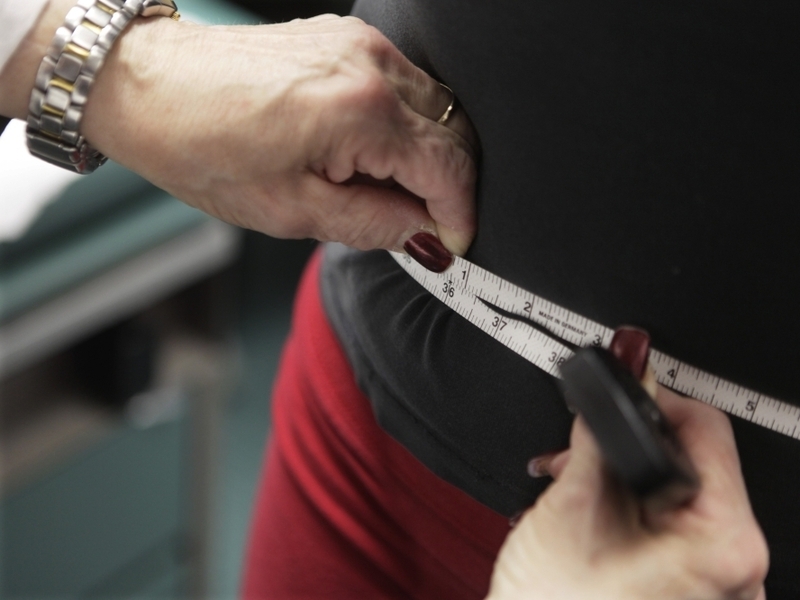 "I think it's fantastic," says Dr. Marijane Hynes, a primary care physician at George Washington Medical Faculty Associates Weight Loss Clinic. "We've been dealing with diabetes and hypertension and working backwards," she says. Now physicians can address obesity on its own, hopefully before related medical problems arise. Under the new rules, beneficiaries whose body mass index is 30 or higher would be eligible for counseling services. The covered benefits include one face-to-face counseling session every week for a month, then counseling every other week for an additional five months. Beneficiaries who have lost at least 6.6 pounds at the end of six months would be eligible for six more monthly counseling sessions. The coverage is in line with current recommendations from the U.S. Preventive Services Task Force, which recommends intensive counseling and behavioral interventions for obese adults. More than a third of Medicare beneficiaries have BMIs over 30, the cutoff for obesity, according to CMS. Until now, doctors didn't get paid for counseling patients about their weight. "Lack of reimbursement is one of those obstacles to getting physicians and their patients into a dialogue about weight management," says Morgan Downey, publisher of the Downey Obesity Report and former executive director of the American Obesity Association. Now, at least for Medicare beneficiaries, that barrier is removed. Many private plans currently cover bariatric surgery for people who are morbidly obese, but don't cover less drastic treatments like counseling before people reach that stage. "For the earlier stages of obesity, coverage is much more spotty, and that's a problem that most employers and health plans are trying to work through," says Ted Kyle, a pharmacist and chairman of the Obesity Society's advocacy committee. Medicare covers bariatric surgery in certain instances. So are most primary care physicians ready to hit the ground running now and begin counseling their Medicare patients about how to change their diets and habits and lose weight? No, says Hynes. But now that doctors will get paid for taking the time to do so, they can offer a handful of suggestions straight off, like encouraging people to get out and walk more or stop drinking sugary juices, she says. Patients who've been struggling to drop pounds for years may in fact be more clued in about weight loss strategies than their doctors, at least initially, says Downey. "But hopefully it will be a minority of cases, and [the new coverage] will encourage physicians to seek out information in this area," he says.